Since our friend was throwing a cookout, I prepared the following dish to pair with the various grilled items for dinner. Such an easy dish and comforting too! Melt 2 tablespoons butter in a large saucepan over medium heat, and whisk in all-purpose flour; cook, whisking constantly, 2 minutes. Whisk in milk gradually; cook, whisking constantly, 5 minutes or until mixture thickens. Remove from heat. Add shredded cheese, salt, and pepper, stirring until cheese melts. Stir in broccoli and pasta. Pour into a lightly greased 11- x 7-inch baking dish. Sprinkle with breadcrumbs; dot with remaining 2 tablespoons butter. To lighten: Substitute equal portions reduced-calorie margarine, 2% reduced-fat milk, and 2% reduced-fat shredded sharp Cheddar cheese, and reduce salt to 1/4 teaspoon. Cook as directed, and pour into baking dish. 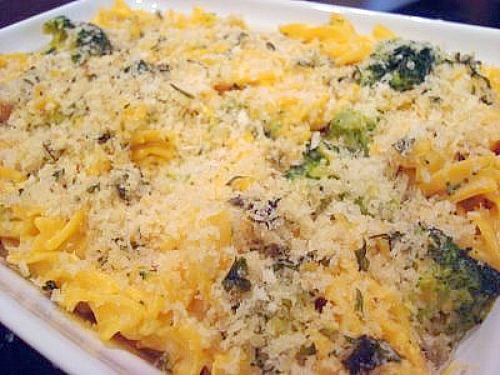 Stir together remaining margarine, melted, and breadcrumbs; sprinkle over pasta mixture. Bake as directed, and let stand 5 minutes before serving. Made this yesterday, very good! I used different types of cheeses in mine and used garlic cheese croutons for the top, along with shredded aged parmesan. The broccoli added great flavor! We are also onion and garlic lovers so we sauteed our onions with some garlic and added that as well. YUM.